“I used to have a big binder for storing whatever I found throughout the year that could be a great mentor text. Now I feel like I’m using Pinterest and favoriting Tweets when I see a video or blog post or something that might lend itself to real study with kids who are eight years old. Troy, you mentioned looking at what kids are interested in, and my students are all about those rainbow band bracelets. I wanted them to look closely at some of those how-to videos on YouTube, so I did all my usual teacher moves on how to study a mentor text. We looked at some other favorites, too. I realized that they knew those videos so much better than I did because they already had a handle on the best people to watch on YouTube for making bracelets and who not to watch. They had studied certain videos as a reader. It was a really different role for me to take on, to just ask them the right questions to determine which craft moves the stronger videos had. They knew those videos so well; they had watched them so many times. I started from scratch like I used to do in my units of study, but they didn’t need that. They knew the videos better because, like you said, there was something in them that caught their eye. Hicks, Troy, and Franki Sibberson. 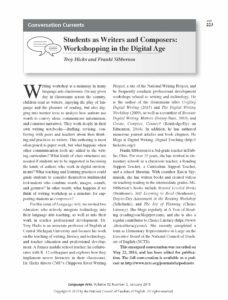 “Students as Writers and Composers: Workshopping in the Digital Age.” Language Arts 92:3 (2015) 223-230. Copyright ©2015 by the National Council of Teachers of English. Reprinted with permission.